4 division world champion Nonito Donaire Jr. of the Philippines is set to face "The Jackal" Carl Frampton on April 21, 2018 for the interim World Boxing Organisation World Featherweight Title. Winner of this fight will face next the undefeated regular champion Oscar Valdez who recently defended his title in a war against Scott Quigg via unanimous decision. Frampton said: "I'm completely focused on Donaire first and foremost but the fact it's for the WBO interim title and the winner gets a shot at Valdez gives it something extra. "I've always been a fan of Donaire. It's an exciting fight and I'm prepared for a hard night. I've got some quality American sparring in and I'm going to come into this one in the shape of my life. "I give credit to Frank Warren and MTK Global for getting this over the line. It's going to be a special night in Belfast." Both fighters was a Super Featherweight champion and now looking for the featheweight belt. 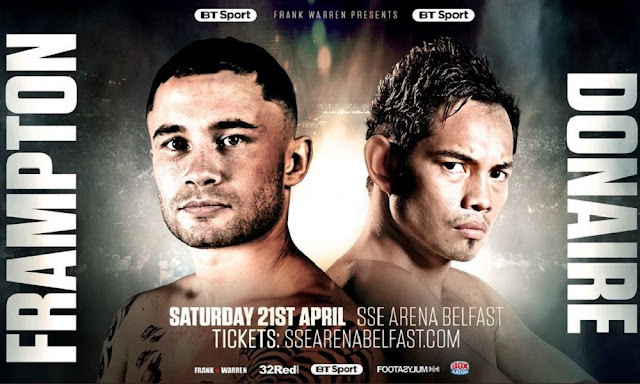 Donaire vs. Frampton fight will be held at The SSE Arena, Belfast in UK.